Quinoa is a perfect breakfast food. It has twice the amount of protein of other grains, and it’s one of the few plant foods that contains all nine essential amino acids, making it a complete protein. Having a breakfast with protein is a great way to keep you full longer. It’s also a good source of calcium, magnesium, fiber, zinc, and iron. Add the omega 3’s and healthy fat from the walnuts, the vitamin C and phytonutrients from the orange juice, and potassium from the banana, and this breakfast packs in some serious nutrition. Okay, it’s good for you. Great. But how does it taste? Delightful. Somehow it’s light and comforting at the same time. The flavors and texture were perfect. I wish I would have gotten around to making quinoa for breakfast sooner. The idea’s been swirling around in my head for a while, but I haven’t tried it until now. So glad I did. In a small sauce pan, bring the milk, orange juice, and orange zest to a boil. Stir in the vanilla, cinnamon, nutmeg, cloves, and quinoa. Reduce heat to medium low, cover, and cook for 12 minutes. Meanwhile, dry toast your walnuts in a small skillet pan. In a small bowl, mash your banana. Stir in the maple syrup and set aside. Remove quinoa from heat and stir in banana/maple syrup mixture. Sprinkle with walnuts and serve. Yes, this takes a little bit more time than standard oatmeal, but it’s totally worth it. You can also make this the night before and heat it up in the morning if you have rushed mornings that don’t allow time for quinoa to cook. Just cook the quinoa the night before, reheat and stir in the mashed banana and maple syrup in the morning. For Meghan, I chop the walnuts to almost a crumb. For an even younger baby, you can leave the walnuts out all together. I made an apple cinnamon quinoa breakfast once. Loved the texture but not flavors. Banana/walnut would probably be much more up my alley! It also has a prominent orange flavor. Just so you know. 🙂 That’s what I loved about it, actually. I too have been debating the idea to try quinoa for breakfast, as well as couscous. I think you have me convinced to give it a go!! I love quinoa for breakfast and like it (and other grains) with coconut milk and a drizzle of honey. I like the cinnamon/nutmeg option too. Do your kids eat quinoa for breakfast? Not sure mine would, though they are good eaters. Yep, Meghan ate this for breakfast today. 🙂 Although she called it “atemeal” (her word for oatmeal) so I’m not sure she knew she was eating quinoa. I’ve never had quinoa for breakfast. I’ll have to give it a try– it looks and sounds delicious! 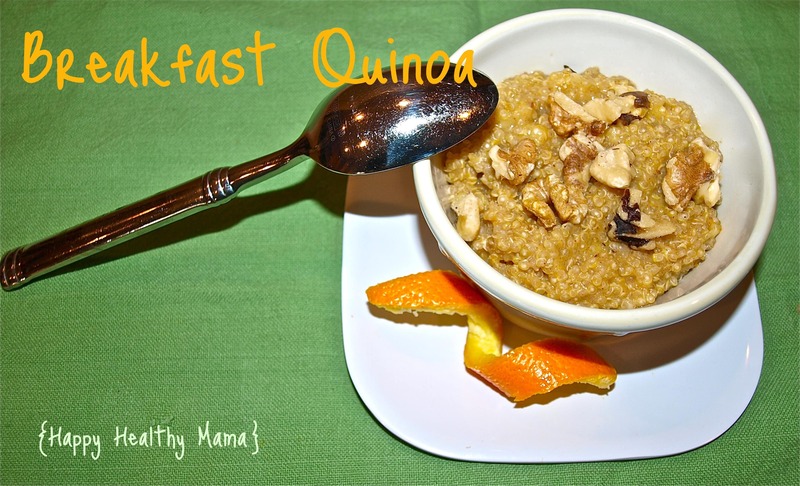 Can’t wait to give this a try….we love quinoa here at our house. Thanks! The orange sounds like a lovely complement for a breakfast dish. I love eating quinoa for bfast! My favorite toppings are cinnamon and banana walnuts! I’ve been looking at eating more quinoa now that I’ve given meat up. Will try!! I just made your recipe and it is deeelicious! I love quinoa and can’t wait to share it with others. Yum yum! trying this recipe at the moment … thanks for the tips .. lately i have been experimenting alot with quinoa for breakfast …. we have a swimming competition later on today … so we wanted to have a good healthy breakfast … thanks for sharing !! I made a half recipe and used a 1:2 quinoa to liquid ratio, so it took me much longer than 12 min to cook–a little less than 20 min. This is perfect! I’ve been looking for a new breakfast alternative to my yogurt, berry, and homemade granola standard, and this hit the spot! I just recently found your blog and I’m in love. I made the chickpea-peanut butter balls the other day and they’re a perfect fueling snack. I’m going to fool my family during the holidays with these much healthier, but still sinful tasting, treats. Can’t wait to try more of your recipes! This was so good! I wrote about it on my food blog, thanks so much for the recipe!! Many of my friends love it as well! I’m not sure what it is about this dish but sadly, thew few times my boyfriend and I have made this, I’ve felt sick after eating it ! 🙁 It tasted yummy but didn’t sit well in my stomach. My boyfriend felt fine! We’re stumped as to what happened, but am going to try your new Nutty Apple Quinoa dish in hopes that it likes me back! That’s really strange. Did you use a different kind of milk than your stomach is used to? I’m sorry that happened! I hope the apple version is nicer to your stomach!